Welcome to another Backup Software Review. Today we are going to have a deep look at the iDrive Online Backup Service. It is a professional backup software and service to help you back up your valuable data to the cloud. 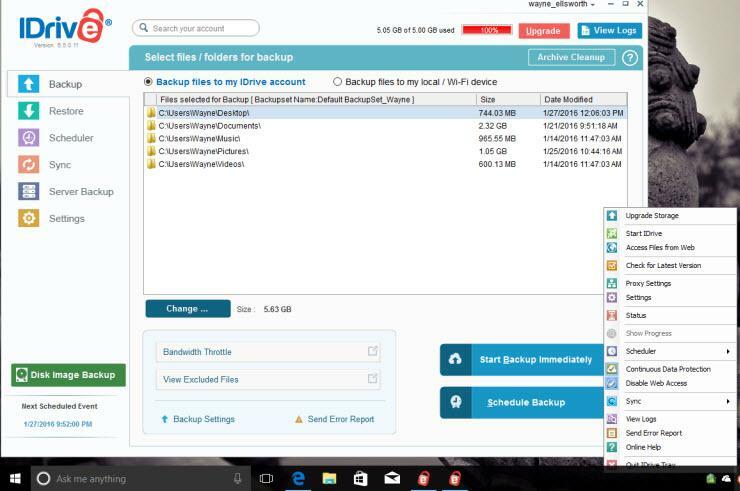 On several backup review websites, iDrive is one of the best cloud backup service. But, is it true? Lets have a look deeper. For you who new to iDrive, it is a cloud storage service or cloud backup service that does it all. You will get a backup and restore application, integrated cloud storage, file sync and file sharing application. It comes with special desktop application to manage the local backup configuration. We can also access the web dashboard to monitor all the backup progress. iDrive comes with many interesting features. The features that you won’t found on most online backup solutions. It supports unlimited PC, Mac, iPhone, iPad and Android devices. There is no limitations on device number. The only limitation you may have is the cloud storage. More devices, you will need more space to store the backup. This is great for you who manages many computers but don’t want to mess with the licensing scenario. Managing multiple devices and computers backups without having to physically access to the devices is possible. The web console lets us to manage any associated devices with your account. The web management console is very easy to use. All your computers and devices are listed here and you can monitor them very easy. Even with iDrive Online Backup Free version, you will have this feature with you. Concern with your cloud backup security and privacy? No worries, iDrive includes a built 256bit AES encryption to ensure your data is secured over the internet transfer process. This Online Backup Software will automatically recognize any modified files on your computer and then perform backup to the cloud in real time. iDrive provides a simple backup software that you need to install on your PC or Mac. It is very easy to use, simple user interface and very intuitive. We can easily manage what to backup from this software. The restoration process also can be done using this iDrive software. You can also download and install this software for Android and iOS devices. This is a unique feature that you won’t find on other backup solution. With iDrive it is very easy to backup Facebook photos or video that you upload to your Facebook account. There are many other features you can have with iDrive. For more information about features, please visit the official website. We do love the licensing option on iDrive. It is very convenience to have single license for multiple devices. Lets say one license for unlimited devices. Also, the client application and web console is very easy to use. The monitoring process is super easy. Its not possible to save our backup to third party cloud storage services such as Amazon S3, Google Drive. iDrive uses their own cloud storage to store our backup. iDrive offers some great features for our backup solution. We can use this backup software to backup our regular data, databases, Virtual machines and many other kind of files. The simple licensing scenario was very convenient. Also, we can put our backup to local devices as well. More or less, iDrive is a Hybrid Backup Solution for you.